Have you just read a great Evolved Publishing (EP) book and now you want to tell the world about it? Maybe you love the work of a particular EP author and wish more people would check out her books. Well, now there’s a way you can help. Plus, as a dedicated fan, there are perks in it for you, too! • A fancy member badge — shown to the right. • Please do not use profanity in this forum. • Please do not spam our members with links to books from outside Evolved Publishing. This is about readers connecting with the EP team. Please set up your own forum for your own work. • Please keep it positive, and let’s have some fun. • All violators will be subjected to a continuous loop of Pee Wee Herman movies. Sometimes writing can be a very lonely road. A supportive group of readers turns a solitary activity into a group one, making it that much more fun for everyone involved. While your enthusiastic presence is great for the author’s soul, there are a number of other simple things you can do to help tell new readers about all the wonderful books by your favorite EP authors, and therefore help them sell more! How cool is that? Once you join the EP Street Team, you’ll find a list of instructions on how you can do little things to help in a big way. Do them all, or do just one or two. Either way, you’re spreading the word and also spreading the love. Periodically, the EP Street Team leader will send group shout-outs to pinpoint one of these methods of helping. You know what else? These tasks serve as a crash course in Social Media 401 (that’s advanced social media, y’all). Sometimes these tasks will also be tied to giveaways that are for team members only. So in summary, performing these small tasks helps your favorite author find new readers, introduces readers to books you love, and could win you a prize. ALL RIGHT! Yes, it’s true. 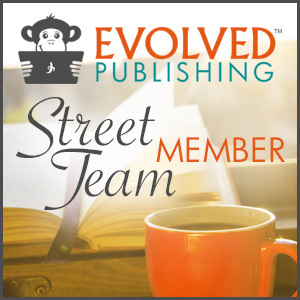 The EP Street Team doesn’t just celebrate the work of a single author, but rather all our authors. A fan of one of our authors? We bet you’ll find someone new who tickles your fancy—hey, aren’t we always on the lookout for the next great read? More authors mean more giveaways, more activities, and more awesomeness all around. Excuse our 80′s slang, but that’s a totally rad deal! Joining the awesomeness that is this team is easy. Just head on over to Facebook, and request to join the group called “Evolved Street Team.” Here’s the direct link. Once you’re in, click over to grab the Street Team Member badge from the “photos” tab, and add it to your blog, linking back to this page. You can also grab the html code for this badge directly from the aforementioned link if that is easier. Those “how to help” documents we mentioned can be found under the “files” tab. Don’t forget to check the “events” tab and to introduce yourself to the other members! Also be sure to sign-up for the Evolved Publishing Newsletter.